The Mayor of Dartford is hosting a charity fundraiser for his 31 different groups, charities and organisations. Mayor of dartford charity bowls match The day, which will begin at 5.30pm will consist of a great game of bowls (both experienced and new players welcome! ), some nibbles and refreshments as well as a time to catch up and have a chat with the Mayor of Dartford, Avtar Sandhu MBE. 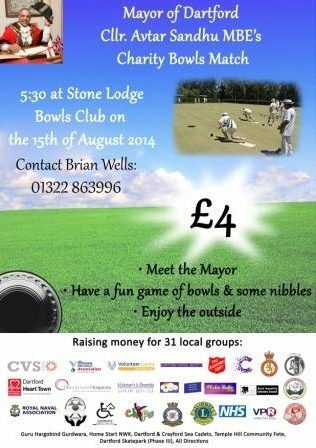 This charity bowls match will be a great opportunity to meet up with friends and have a great day in the outdoors. If you do wish to purchase a ticket to help the Mayor of Dartford, please call Brian Wells on 01322 863996.